Aga Khan I was the title awarded to Hasan Ali Shah (b. 1804 in Kahak, Iran; d. 1881 in Bombay, India), the governor of Kirman, 46th Imam of the Ismaili Muslims, and prominent Muslim leader in Iran and later in South Asia. After a period in favor in Persia, he became involved in conflict following the death of his sponsor and moved to India, where he assisted the British in several conflicts and received a government pension. Although he did not rule a princely state, he was addressed by the British as "His Highness" and treated, in protocol terms, as a member of the Princely class (his wife was a Persian princess). 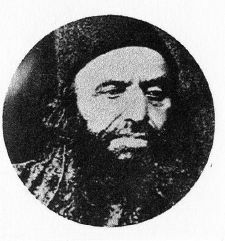 In 1866, a court ruling officially recognized him as spiritual leader of the Khoja Ismailis in India. Aga Khan I began a process, continued by his successors, in which the Ismaili community's international organization was strengthened, its educational, humanitarian and philanthropic activities were developed on a larger scale, and support for inter-governmental cooperation and initiatives aimed to achieve global peace became a significant priority. Members of the community live in 25 countries and number approximately six million. About two million live in Pakistan. The Imam Hasan Ali Shah was born in 1804 in Kahak, Iran to Shah Khalil Allah, the 45th Ismaili Imam, and Bibi Sarkara, the daughter of Muhammad Sadiq Mahallati (d. 1815), a poet and a Ni‘mat Allahi Sufi. Shah Khalil Allah moved to Yazd in 1815, probably out of concern for his Indian followers, who used to travel to Persia to see their Imam and for whom Yazd was a much closer and safer destination than Kahak. Meanwhile, his wife and children continued to live in Kahak off the revenues obtained from the family holdings in the Mahallat region. Two years later, in 1817, Shah Khalil Allah was killed during a conflict between some of his followers and local shopkeepers. He was succeeded by his eldest son Hasan Ali Shah, also known as Muhammad Hasan, who became the 46th Imam. The Ismaili Imams trace themselves back to Muhammad through his daughter Fatimah and her husband, Ali. The Ismailis, as they became known, who are Shi'a split from the majority of Shi'a after the death of Ja'far al-Sadiq when they chose Ismail bin Jafar as their 7th Imam, while the majority chose Musa. The Ismailis, like all Shi'a, often lived as a minority under Sunni rule keeping their identity and that of their Imam a secret. However, under the Fatimids in Egypt, when they were rivals of the Abbasids, the Ismaili Imams were able to reveal their identity. Several schisms took place during the history of the Ismaili community, which dispersed following the collapse of the Fatimids. That was the last time that Ismaili Imams exercised political as well as spiritual authority. However, the succession of Imams continued down through the centuries; they are regarded as inspired and as infallible by their followers. He is known as the "present" (or living Imam), since the 12th Imam of the majority of Shi'a, who went into "occultation" in 940 C.E. and is referred to as the "Hidden Iman." In theory, the Iman's authority is "absolute; in practice it covers religious and community matters." After the collapse of the Fatimids, the Nizari lineage of Imams took refuge with the mini-state at Alamut led initially by Hassan-i Sabbah (1090–1124) where for some time their identity was again hidden, until Imam Hassan II, the 23rd Ismaili Imam who died in 1166. The line appears to have settled in province of Kirman, Persia in the fifteenth century with the 29th Imam. Later, they took part in the administration of the province and one Imam married a Persian princess. The term "Nizari" is from the name of the 19th Imam, Nizār ibn al-Mustanṣir billāh, son of al-Mustansir, who died in prison 1094. He was not recognized by the Mustaali, who broke away under a different succession. However, becoming the 46th Imam of the Ismailis did not automatically guarantee either Hasan Ali Shah's safety or at this time financial security. In fact, his family was left unprovided for after a conflict between the local Nizaris and Hasan Ali Shah's son-in-law Imani Khan Farahani, who had been in charge of the Imam's land holdings. The young Imam and his mother moved to Qumm but their financial situation worsened. The Imam Hasan Ali Shah's mother decided to go to the Qajar court in Tehran to obtain justice for her husband's death and was eventually successful. Those who had been involved in the Shah Khalil Allah's murder were punished and the Shah of Persia, Fath Ali Shah increased Hasan Ali Shah's land holdings in the Mahallat region and gave him one of his daughters, Sarv-i Jahan Khanum, in marriage. Fath Ali Shah also appointed Hasan Ali Shah as governor of Qumm, the leading intellectual center of Shi'a Islam and gave him the honorific of Aga Khan (Chief Commander). Hasan Ali Shah thus become known as Aga Khan Mahallati, and the title of Aga Khan was inherited by his successors. Aga Khan I's mother later moved to India where she died in 1851. Until Fath Ali Shah's death in 1834, the Imam Hasan Ali Shah enjoyed a quiet life and was held in high esteem at the Qajar court. The "Highness" part of the honorific that is traditionally accorded to the Aga Khans recognizes their status as descendants of the Persian royal family. Soon after the accession of Muhammad Shah Qajar to his grandfather, Fath Ali Shah, the Imam Hasan Ali Shah was appointed governor of Kirman in 1835. At the time, Kirman was held by the rebellions sons of Shuja al-Saltana, a pretender to the Qajar throne. The area was also frequently raided by Afghans and Baluchis. Hasan Ali Shah managed to restore order in Kirman, as well as in Bam and Narmishair, which were also held by rebellious groups. Hasan Ali Shah sent a report of his success to Tehran, but did not receive any compensation for his achievements. Despite the service he rendered to the Qajar government, Hasan Ali Shah was dismissed from the governorship of Kirman in 1837, less than two years after his arrival there, and was replaced by Firuz Mirza Nusrat al-Dawla, a younger brother of Muhammad Shah Qajar. Refusing to accept his dismissal, Hasan Ali Shah withdrew with his forces to the citadel at Bam. Along with his two brothers, he made preparations to resist the government forces that were sent against him. He was besieged at Bam for some fourteen months. When it was clear that continuing the resistance was of little use, Hasan Ali Shah sent one of his brothers to Shiraz to ask the governor of Fars to intervene on his behalf and arrange for safe passage out of Kirman. Following negotiations by the governor on his behalf, Hasan Ali Shah surrendered and emerged from the citadel of Bam only to be double-crossed. He was seized and his possessions were plundered by the government troops. Hasan Ali Shah and his dependents were then sent to Kirman where they remained prisoners for eight months. He was eventually allowed to go to Tehran near the end of 1838-39, where he was able to present his case before the Shah. The Shah pardoned him on the condition that he return peacefully to Mahallat. Hasan Ali Shah remained in Mahallat for about two years. However, he managed to gather an army in there which alarmed Muhammad Shah, who traveled to Delijan near Mahallat to verify the reports he had received. Hasan Ali Shah was on a hunting trip at the time but hearing that the Shah was nearby sent a messenger to request permission to go to Mecca for the hajj pilgrimage. Permission was given, and Hasan Ali Shah's mother and a few relatives were sent to Najaf and other holy cities in Iraq in which the shrines of his ancestors, the Shiite Imams are found. Before leaving Mahallat, Hasan Ali Shah equipped himself with letters appointing him to the governorship of Kirman. Accompanied by his brothers, nephews and other relatives, as well as many followers, he left for Yazd, where he intended to meet some of his local followers. Hasan Ali Shah sent the documents reinstating him to the position of governor of Kirman to Bahman Mirza Baha al-Dawla, the governor of Yazd. Bahman Mirza offered Hasan Ali Shah lodging in the city but Hasan Ali Shah declined, indicating that he wished to visit his followers living around Yazd. Hajji Mirza Aqasi sent a messenger to Bahman Mirza to inform him of the spuriousness of Hasan Ali Shah's documents and a battle between Bahman Mīrzā and Hasan Ali Shah broke out in which Bahman Mirza was defeated. Other minor battles were won by Hasan Ali Shah before he arrived in Shahr-i Babak, which he intended to use as his base for capturing Kirman. At the time of his arrival in Shahr-i Babak, a formal local governor was engaged in a campaign to drive out the Afghans from the city's citadel, and Hasan Ali Shah joined him in forcing the Afghans to surrender. Soon after March 1841, Hasan Ali Shah set out for Kirman. He managed to defeat a government force consisting of 4,000 men near Dashtab and continued to win a number of victories before stopping at Bam for a time. Soon, a government force of 24,000 men forced Hasan Ali Shah to flee from Bam to Rigan on the border of Baluchistan, where he suffered a decisive defeat. Hasan Ali Shah decided to escape to Afghanistan, accompanied by his brothers, many soldiers and servants. After arriving in Afghanistan in 1841, Hasan Ali Shah proceeded to Kandahar which had been occupied by an Anglo-Indian army in 1839. A close relationship developed between Hasan Ali Shah and the British, which coincided with the final years of the First Afghan War (1838-1842). After his arrival, Hasan Ali Shah wrote to Sir William Macnaghten, discussing his plans to seize and govern Harat on behalf of the British. Although the proposal seemed to have been approved, the plans of the British were thwarted by the uprising of Dost Muhammad's son Muhammad Akbar Khan, who defeated the British-Indian garrison on its retreat from Kabul in January 1842. The uprising spread to Kandahar, and Hasan Ali Shah helped to evacuate the British forces from Kandahar in July 1842. Hasan Ali Shah soon proceeded to Sind, where he rendered further services to the British. The British were able to annex Sind and for his services, Hasan Ali Shah received an annual pension of £2,000 from General Charles Napier, the British conqueror of Sind with whom he had a good relationship. The terms of the pension included recognition of the Aga Khan's right to be addressed as "His Highness." Hasan Ali Shah also aided the British militarily and diplomatically in their attempts to subjugate Baluchistan. He became the target of a Baluchi raid, likely in retaliation for his helping the British; however, Hasan Ali Shah continued to aid the British, hoping that they would arrange for his safe return to his ancestral lands in Persia, where many members of his family remained. In October 1844, Hasan Ali Shah left Sind for Bombay, passing through Cutch and Kathiawar where he spent some time visiting the communities of his followers in the area. After arriving in Bombay in February 1846, the Persian government demanded his extradition from India. The British refused and only agreed to transfer Hasan Ali Shah’s residence to Calcutta, where it would be more difficult for him to launch new attacks against the Persian government. The British also negotiated the safe return of Hasan Ali Shah to Persia, which was in accordance with his own wish. The government agreed to Hasan Ali Shah's return provided that he would avoid passing through Baluchistan and Kirman and that he was to settle peacefully in Mahallat. Hasan Ali Shah was eventually forced to leave for Calcutta in April 1847, where he remained until he received news of the death of Muhammad Shah Qajar. Hasan Ali Shah left for Bombay and the British attempted to obtain permission for his return to Persia. Although some of his lands were restored to the control of his relatives, his safe return could not be arranged, and Hasan Ali Shah was forced to remain a permanent resident of India. While in India, Hasan Ali Shah continued his close relationship with the British, and was even visited by the Prince of Wales when the future King Edward VII of the United Kingdom was on a state visit to India. The British came to address Hasan Ali Shah as His Highness. Hasan Ali Shah received protection from the British government in British India as the spiritual head of an important Muslim community. The vast majority of his Khoja Ismaili followers in India welcomed him warmly, but some dissident members, sensing their loss of prestige with the arrival of the Imam, wished to maintain control over communal properties. Because of this, Hasan Ali Shah decided to secure a pledge of loyalty from the members of the community to himself and to the Ismaili form of Islam. Although most of the members of the community signed a document issued by Hasan Ali Shah summarizing the practices of the Ismailis, a group of dissenting Khojas surprisingly asserted that the community had always been Sunni. This group was outcast by the unanimous vote of all the Khojas assembled in Bombay. In 1866, these dissenters filed a suit in the Bombay High Court against Hasan Ali Shah, claiming that the Khojas had been Sunni Muslims from the very beginning. The case, commonly referred to as the Aga Khan Case, was heard by Sir Joseph Arnould. The hearing lasted several weeks, and included testimony from Hasan Ali Shah himself. After reviewing the history of the community, Justice Arnould gave a definitive and detailed judgment against the plaintiffs and in favor of Hasan Ali Shah and other defendants. The judgment was significant in that it legally established the status of the Khojas as a community referred to as Shia Imami Ismailis, and of Hasan Ali Shah as the spiritual head of that community. The ruling upheld the Aga Khan's right to freely dispose of "community assets." After this, Hasan Ali Shah's authority was not seriously challenged again. Aga Khan I did much to consolidate the community's internal organization and sense of identity in addition to strengthening relations with external authorities. His move from Persia to India also helped to consolidate the Imam's role as leader of the whole Khoja Ismaili community, and to develop that community's trans-national infrastructure. Hasan Ali Shah spent his final years in Bombay with occasional visits to Pune. Maintaining the traditions of the Iranian nobility to which he belonged, he kept excellent stables and became a well-known figure at the Bombay racecourse. The Khojas were a trading community with links across the sea to Africa as well as along the Indian coast. By tradition, one eighth of a follower's income was payable to the Imam. Hasan Ali Shah used this revenue to consolidate the internal organization of the community. Hasan Ali Shah passed away after an imamate of sixty-four years in April 1881. He was buried in a specially built shrine at Hasanabad in the Mazagaon area of Bombay. He was survived by three sons and five daughters. Hasan Ali Shah was succeeded as Imam by his eldest son Aqa Ali Shah, who became Aga Khan II. Aga Khan I bridged the period during which the Ismaili community lived in relative isolation and when its Imams lived in political obscurity and the period in which the Ismaili Imams, known as the Aga Khans, became internationally known leaders of a vibrant social and spiritual community. Aga Khan Ismailis live as loyal citizens of the nations where they reside but retain distinctive social and spiritual institutions as well as their religious identity. The Aga Khans now lead a truly trans-national community, whose members contribute to the societies where they live but who also regard themselves as world citizens. The Aga Khans have been strong supporters of the League of Nations and of the United Nations and have worked to achieve human unity and world peace through humanitarian action and philanthropy. They have also done much to situate their spiritual community as a mainstream Muslim movement finding educational initiatives, for example, that benefit all Muslims. Aga Khan I's heirs also continued his horse-racing tradition. Treading on an international stage, they have enjoyed a celebrity status unknown to earlier Imams. However, their commitment to the spiritual leadership of their community and to human welfare generally has become even more evident. On the one hand, the Aga Khans do not possess political power in terms of leading a nation. On the other hand, their leadership of the Ismaili community is not restricted to what might be thought of as "religious affairs" since they also exercise authority in the social, economic and cultural spheres. ↑ 1.0 1.1 Halm 1991, pg. 191. History of "Aga Khan I"
This page was last modified on 6 February 2019, at 19:16.